When Congress established average sales price (ASP) as the basis for Medicare Part B drug reimbursement, it also provided a mechanism for monitoring market prices and limiting potentially excessive payment amounts. The Social Security Act mandates that OIG compare ASPs with average manufacturer prices (AMPs). If OIG finds that the ASP for a drug exceeds the AMP by a certain percentage (currently 5 percent), the Act directs the Secretary of Health and Human Services to substitute the ASP based payment amount with a lower calculated rate. Through regulation, CMS outlined that it would make this substitution only if the ASP for a drug exceeded the AMP by 5 percent in the 2 previous quarters or 3 of the previous 4 quarters. Over the last decade, OIG has produced annual reports aggregating the results of our mandated quarterly ASP to AMP comparisons. This annual report quantifies the savings to Medicare and its beneficiaries that are a direct result of CMS's price substitution policy based on 2015 average sales prices, and this report also offers recommendations for achieving additional savings. To determine the effects of the price substitution policy, we determined the difference between ASP-based payment and AMP-based payment for each drug with a price substitution. We then applied this difference to the Medicare utilization for each of these drugs. To account for a 3 quarter lag between the reporting of pricing data and applying price substitutions, we used drug utilization data for the fourth quarter of 2015 through the third quarter of 2016 to calculate the savings based on 2015 ASP data. CMS lowered Part B reimbursement for 13 drugs on the basis of 2015 data. CMS's price-substitution policy saved Medicare and its beneficiaries $5.4 million over 1 year based on 2015 data. 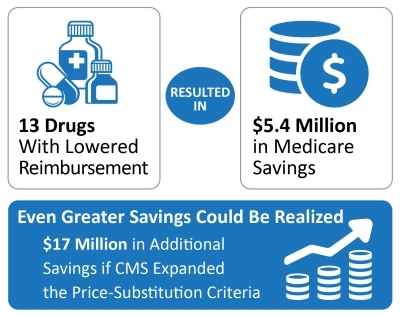 Medicare and its beneficiaries could have saved up to an additional $17 million over 1 year if CMS implemented a more expansive price substitution policy that, for example, allowed substitution for drugs that exceeded the 5 percent threshold in a single quarter. Because of the potential for savings to Medicare beneficiaries and the program, OIG recommends that CMS expand the price-substitution policy. CMS did not concur with the recommendation. However, CMS stated that as additional data becomes available and as it continues to gain experience with the price substitution policy, it will consider further changes as necessary. OIG recognizes that CMS, in setting policy for payment substitution, needs to achieve an important balance between safeguarding access to drugs and ensuring that Medicare and its beneficiaries do not overpay for drugs. To provide greater flexibility and achieve this continued balance, any future expansion of the payment-substitution policy could contain a provision that would prevent a price substitution when there are indications that the substitution amount is below the provider acquisition costs.